This 64 had, if I’m remembering correctly, 29 filled holes in it. There was a removed arm rest, the bridge was repositioned, there was a removed back pad, tuner change holes and a few other insults. Played great. Sounded great and was a bargain to boot. Looks pretty good from the front because nearly all the holes are on the back. Odd name for a post. If I don’t care about it, why should I write about it? Because you do. And maybe you shouldn’t (or at least not so much). 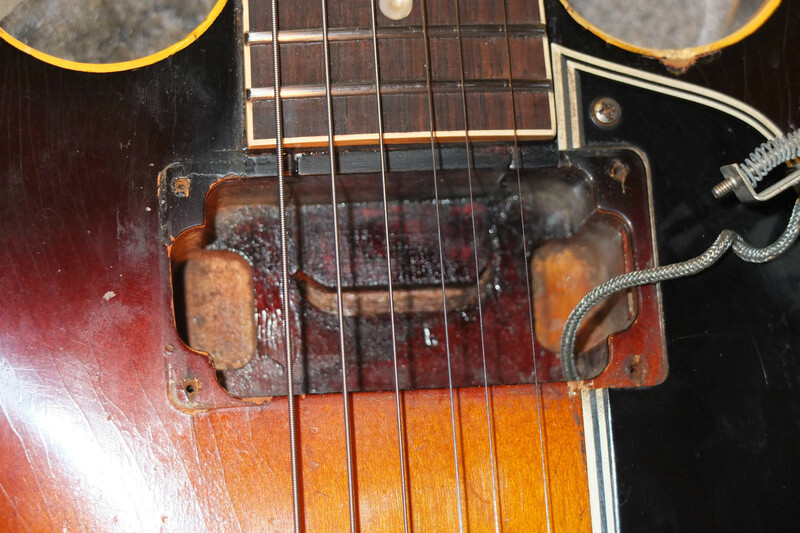 It’s in the nature of both guitarists and collectors to be detail oriented and more than a little picky. Guitar collectors who play their guitars and not lock them in a humidified cabinet are the most picky of all. Ideally, it has to be three things: great tone, great playability and great looking. It’s the fourth element-originality-that gets so many of us nuts. Here, we’ll talk about the first three. Or I’ll talk and you’ll (hopefully) listen. Good news first. Great tone is achievable on the huge majority of pre Norlin (1969) ES 3×5’s. Yes, t-tops in a 68 are going to sound different than PAFs in a 58 but I’ve heard 68’s that are stunning. To get your great tone, you may have to fix a sagging bridge or raise or lower the pickups, do a re-fret or put in a new nut but these are the kind of changes I don’t care about. Put the old nut and bridge in the case and stop worrying. What about bad wood? There is nothing wrong with the wood through the 60’s. It’s maple and poplar plywood (usually) and its properly dried and it has had 50 years to settle in. 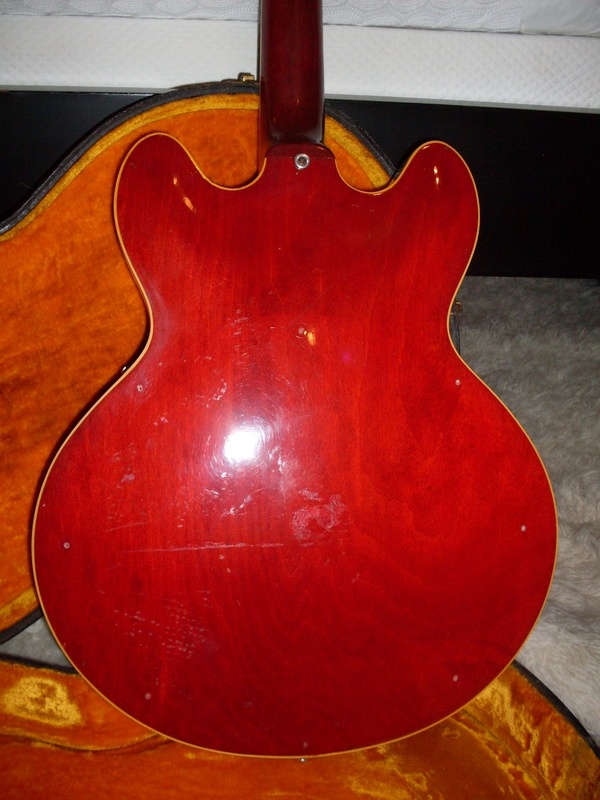 Just play the average 70’s 335 and you’ll notice a difference-the wood changed-it’s heavier and less resonant. There’s also less of it as they started shortening the center bock and got rid of the mahogany end pieces. Yes, there are great sounding 70’s 335’s. Just not a lot of them. There are good and not so good PAFs, patent numbers and t-tops. Changing a pickup you don’t like for another correct one is not a big deal to most of us. It is, in fact, something I don’t care about. Do I prefer the originals? I do but not if they don’t sound good. Appearance issues can kill a deal pretty quickly with a lot of players but great tone often trumps it. Most players will take an ugly guitar that plays great over a beautiful guitar that plays like crap. On the other hand, why shouldn’t you have both. Answer? You should but it’s gonna cost you. But there are, once again, things I don’t care about. Wear in the usual places-arm, back and back of the neck certainly affect the appearance and that should be reflected in the price. If you care about it, then I get it and I agree. It’s just that the price can be a compelling force even if you don’t like the appearance. The back of the neck is the exception. It doesn’t particularly bother me visually or feel wise but I get that it bothers some players. But that’s a point to be made under “playability”. Plugged holes are really an appearance issue too and also something I don’t really care about as long as it’s reflected in the price. 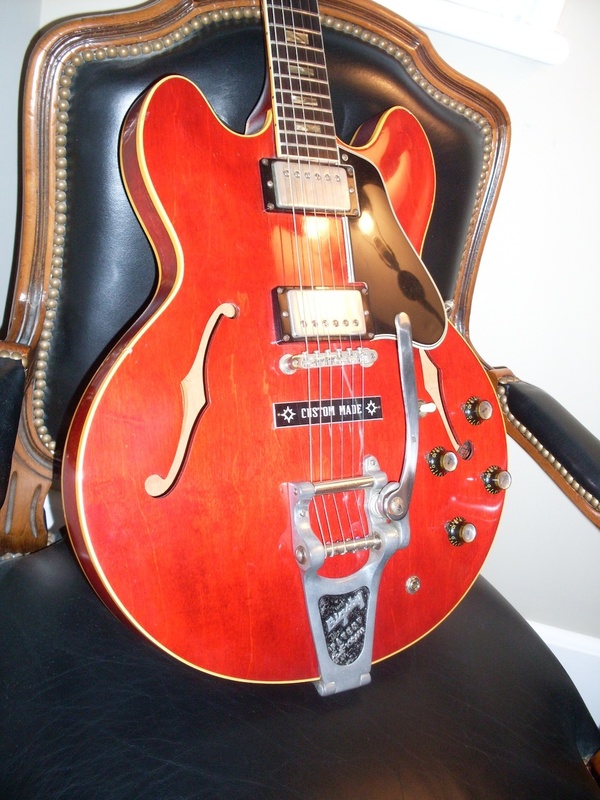 Yes, it kills the “investment” angle but a 335 with a couple of Bigsby holes and a removed coil tap switch will sound the same as a collector grade one. If you cut a big access panel in the back of a 335, it won’t affect the tone or playability either. But I’ll never buy one that has had that done unless it’s something so rare that I’ll never see another. No logical reason I just hate it. Full disclosure? Yes, I bought a stop tail 355 with an access panel. Playability can be the tricky part. There’s a lot that can be done by a competent luthier to make a marginal player into a good one. But can we make it into a great one? It depends on what’s wrong. It’s hard to separate playability from tone sometimes but if you play a 335 unplugged, you’ll have a better understanding of where they overlap and where they don’t. Resonance is a tone component and if it’s not good unplugged, it doesn’t mean it won’t sound good plugged in. The reverse is true as well. Unplugged resonance is, in fact, something I don’t care about because I will be playing plugged in. But playability goes way beyond that. If the guitar doesn’t feel good to you, you need to consider why that is. Action? Generally fixable. Bad intonation? Generally fixable. Dead frets? Inconsistent sustain? Poor balance between strings? There are so many factors involved in playability that I often take the easy way out when confronted with a 335 that doesn’t play well. I walk away. It’s rare for a 335 to be a dog (at least from 58-68). But I’ve had 335’s (and 345’s and 355’s) with a perfectly straight neck, level frets, a properly cut nut a no sign of a structural issue that fret out, don’t sustain, have “wolf” notes (notes that are louder or more resonant than others), buzzes, rattles and on and on. My advice? If you don’t like the way it plays, don’t buy it. The luthiers will disagree and probably rightly so but there are limits. Money limits. I had a 61 335 that looked just great but could not be made playable. It was dull sounding and the sustain was really inconsistent all over the fretboard. It went to three separate and very competent luthiers. It had two fret jobs with different sized fret wire and a fingerboard planing. After spending close to $1000 on it, I gave up. To paraphrase Bob Fosse “I can’t make you a good player but I can make you a better player”. But I don’t want a better player. I want a good one. Next, we’ll look at the final element-originality. This is the one that makes so many player/collectors nuts. It’s also the one that makes me nuts. You really wanted to se the holes, didn’t you. OK, here’s the back. No one will ever see it. This was re-necked at Gibson back in 2010 or so. They did a great job using the neck from a Clapton reissue and charging me $4000. I wish I still had the detail shots. Sure played great though. About 6 and a half years ago, back in the early days of this blog, I wrote a post called “Renecks, not Rednecks”. You can find it here. The post dealt with how to spot a renecked ES model (and how to tell a redneck from a reneck which, by the way is the default spelling the stupid spellchecker decides I really want to write when I write the term reneck without a dash). Well, since I wrote that post in October of 2010, I’ve come to look at renecked 3x5s a little differently. They still aren’t collector grade stuff but there is a lot to be said for bringing a great sounding guitar back into the realm of real playability and personal preference. I’ve had a few done since that post and will talk about my experiences. The first was a red 335 that I bought off Ebay with all of its parts but no neck. I was told it was a 65 but in 20/20 hindsight, I think it was a 68-no headstock inlay to tip me off and I didn’t notice whether the f-holes were big or small. I wrote to the repair folks at Gibson and they told me that there weren’t any necks that would fit a 65/68 except for the recently released necks from the Eric Clapton “Crossroads” reissue. I was thrilled (until they told me how much it would cost). The estimate was $4000 (and six months). I had paid around $1500 for the body and hardware so I thought it might make a nice player for me. The market was pretty weak in 2011 but I went ahead and they did a truly excellent job except that the G string wouldn’t intonate-they must have mis-measured the scale by a fraction of an inch. I was able to to find a luthier who worked some magic on the nut and the problem was solved. It turned out to be a great player with a great neck and I eventually sold it and didn’t make a dime on it. Why? Probably because it had been re-necked. I swore off projects for a while. A number of years later I bought a 61 dot neck that sounded absolutely glorious but had a badly broken and badly repaired headstock. I also didn’t like the flat neck profile much. I sold the guitar to a dealer in Toronto who had it renecked by Gord Barry who, I believe, works (or worked) at the well known 12th Fret guitar shop there. He used an old growth piece of mahogany, the original fingerboard, binding and truss rod and carved a very 59ish profile. I can’t remember if he used the headstock inlay or not on this one. The work cost around $3500 which, when you’re talking about a dot neck isn’t so much, really. especially when it goes from being a great sounding busted 61 with a so-so neck to being a great sounding intact 61 with a custom neck profile. Not long after the work was done, the guitar was offered back to me and I remembered what a great sounding guitar it was. The work was spectacular. If the seller hadn’t disclosed the reneck, I don’t think anyone would have known-not even me. It was not an easy guitar to sell. The purists scoffed at it but the logic was pretty sound. You were basically getting a player grade 61 with a 59 neck. The only way to get a big 59 neck is to buy a 59 (or a 58) and that would set you back $30K or so even for a player grade. So, I sold it for around $15K and didn’t exactly get rich off of it. Upside? The buyer still has it and tells me how much he loves it every time I speak to him. Lucky guy. Not long ago, I bought a 60 335 with a 66 block neck on it. I called Gord Barry and asked if he could do the same work on this one. We couldn’t use the fingerboard (it had block markers) but I had a piece of beautiful Brazilian I’d been saving for decades. He used the original truss rod and the headstock overlay in all its checked and yellowed glory. The result was stunning. Another ruined dot neck brought back to life. Again, I didn’t make a dime on it but sold it to a regular client who has owned no less than a dozen dot necks (4 of which he bought from me). The reneck is his favorite. 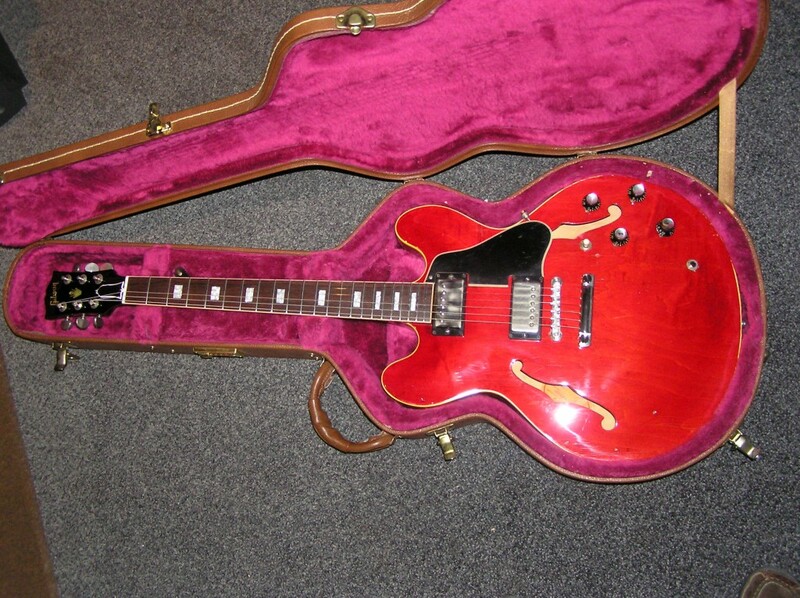 Same deal-a great sounding guitar turned from an uncollectible marginal player to an uncollectible great player. That’s a good return but not particularly good business. It is good PR though. There are some very happy players out there who bought themselves killer dot neck players with the neck profile they really wanted and saved $10000 or more. 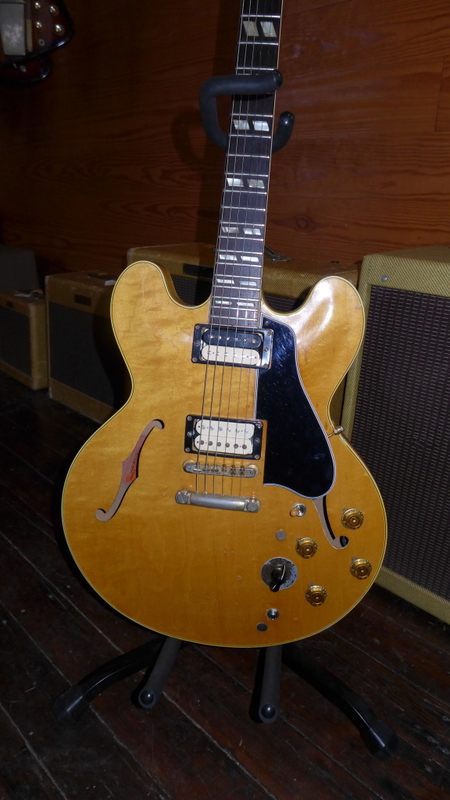 A few weeks ago I bought a fairly well trashed ES-345 TDN-yes, a blonde. It had two holes drilled in the top, all the wrong parts, a heavily shaved neck and two repaired headstock breaks. The finish was in very good shape though and the wood was quite stunning. The solution was obvious. It was, after all, an original finish blonde 345 and they only made 50 of them. So off it goes. We will use the original fingerboard, bindings and truss rod and hopefully the headstock overlay. It will get a proper 59 neck carve using a old growth piece of mahogany. We’ll fill the two holes and have a killer player. Add a couple of uncovered double white PAFs and we’ll have something so cool I won’t be able to let it go. What’s it worth? Beats me. What makes me OK with doing this is that as long as the luthier can get the good old wood, I don’t really care if the neck was made by a skilled factory worker in 1959 or an accomplished luthier in 2017. If one is better at it than the other, I certainly can’t tell. It will take a long time to get that blondie done-guys like this are always booked well in advance, so I expect to have it completed by September. I’m totally stoked. Add an old growth mahogany 59 profile new neck, the original board, bindings and frets, a correct long guard, the right knobs and fill those nasty holes and I’ll have a keeper. If not for me then for somebody.